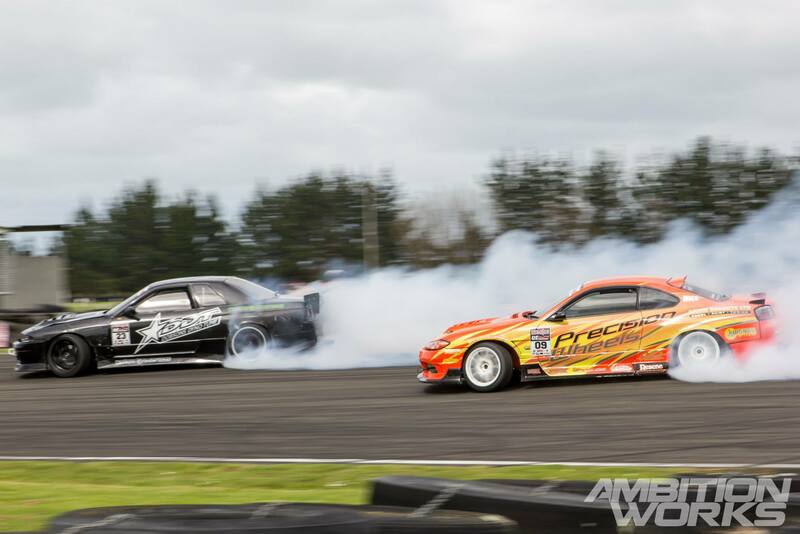 The 2014/2015 Demon Energy D1NZ Series started off last weekend returning to Manfeild Raceway after a long absence for the first round of the series. 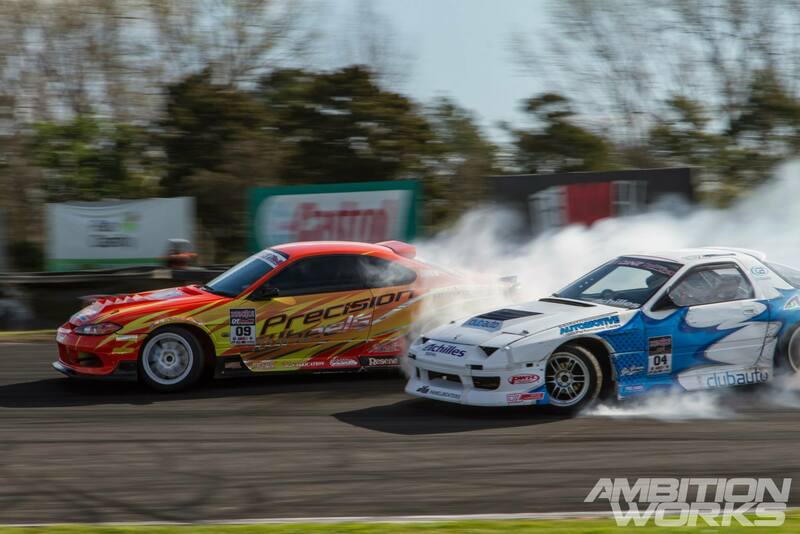 Friday was scheduled for practice and part of the pro-am series, while Saturday was left for the podium positions for pro-am and the top 32 pro drivers to battle it out for that 1st place at round one! 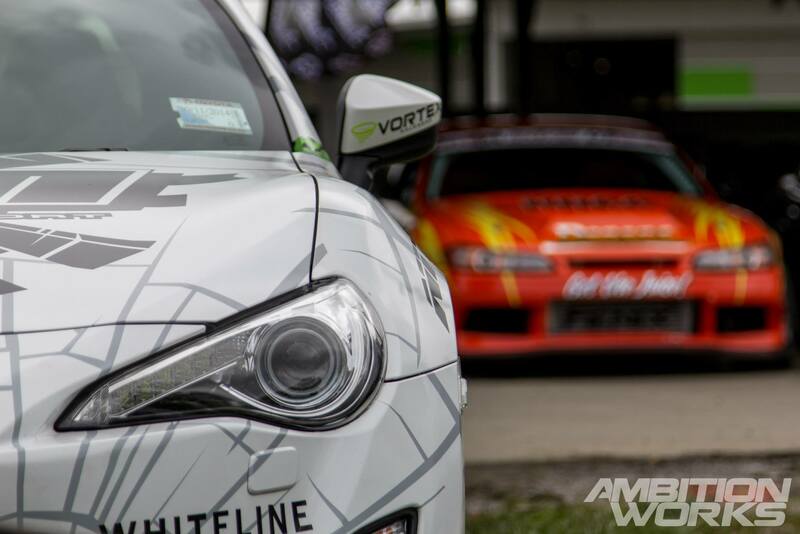 This was the first time that the public was able to see all of the cars new liveries in person, this series teams have really pushed themselves to step out of the box because these cars were on a different level altogether, livery, engine and body wise. 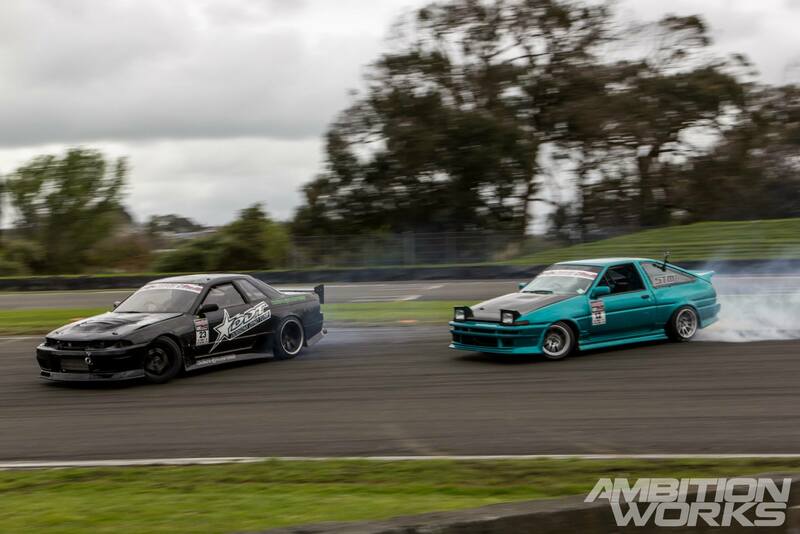 The C’s Garage boys have kept the same livery as last year with a few little changes here and there, with Origin Labo coming on board they now rock canards and other little extras around the body, they have really brought Japan closer to D1NZ this series. A new young gun to watch this year is Pernell Callaghan, having only been drifting for a year his talents are starting to show. Attending every track day he can get his hands on track time isn’t a worry however when the pressure rose during battles a few little mistakes took him out of the podium for round one. 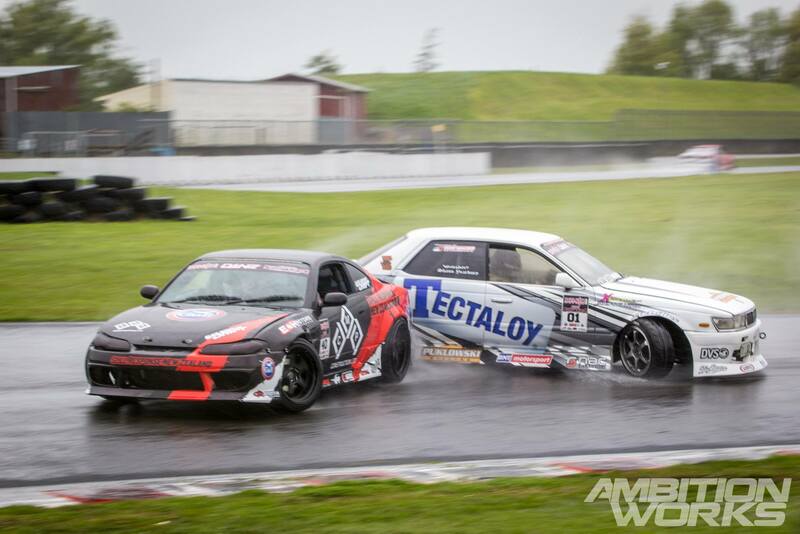 Weather conditions for day one were terrible, heavy winds and pouring rain didn’t make it easy for teams when they wanted to spend the day practicing for the coming battles. 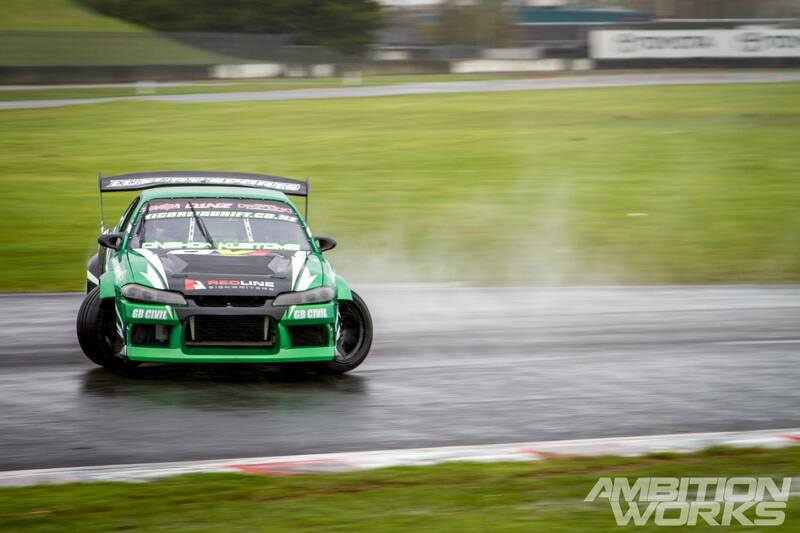 With Gaz Whiter sending his S14 to Australia for the World Time Attack Challenge he was borrowing an old D1NZ car with less power, but he definitely took up the challenge. 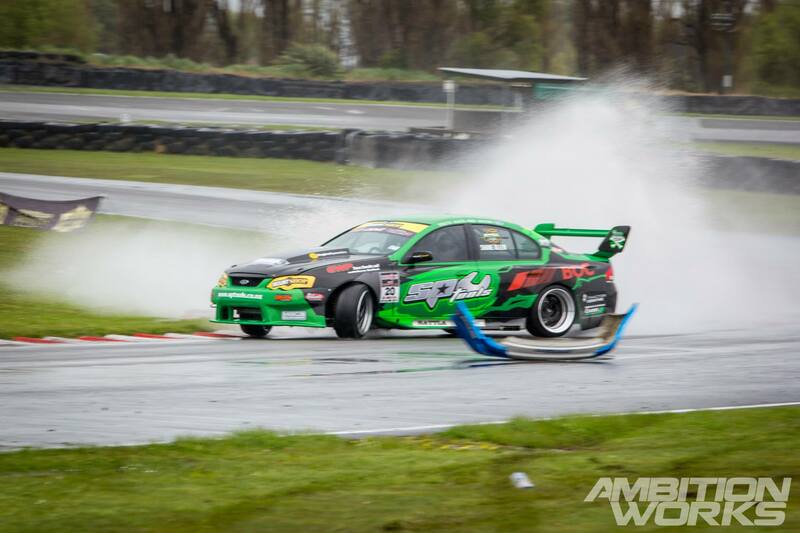 A massive puddle started to appear after turn one, a good photo opportunity but it gave another obstacle for drivers to maneuver on top of the high winds and downpour of rain. A few battles during practice started to get underway, however distance between the two cars started to pick up during day one. 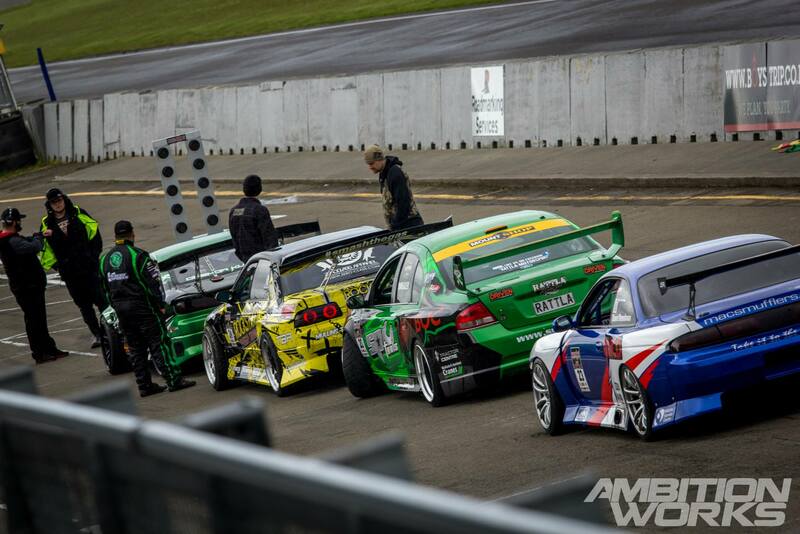 Luckily for most of the drivers the battles were on Saturday. 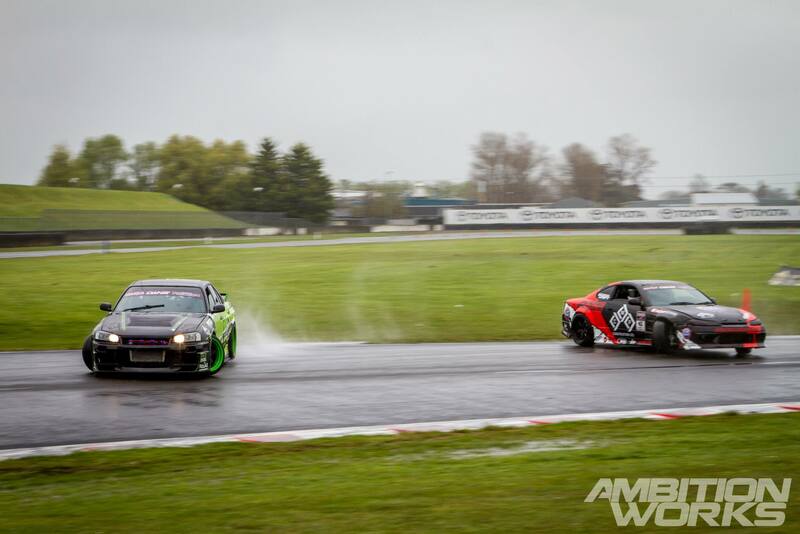 However wet weather gave unpredictable results, this lead to a couple of minor crashes here and there but for the majority of the weekend there were no ‘dangerous’ crashes. 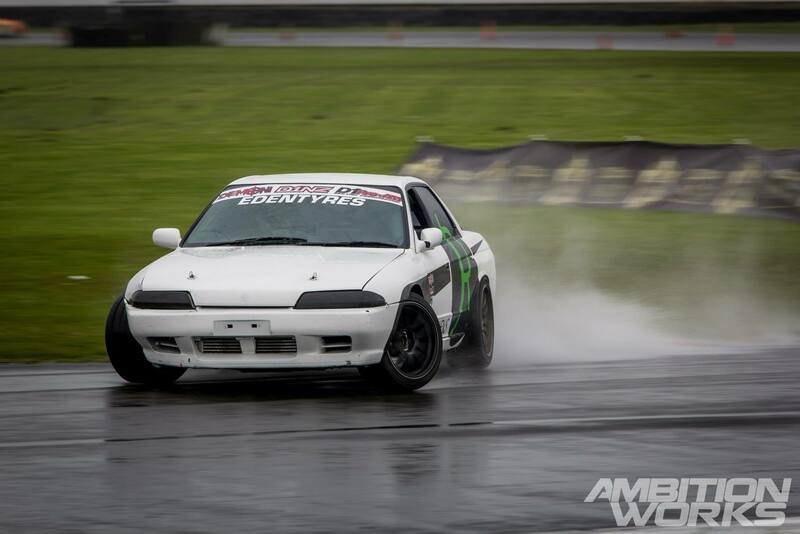 Ben Jenkins put on a good show pushing through the pouring rain, another pro-am driver with plenty of power that should be watched this series. 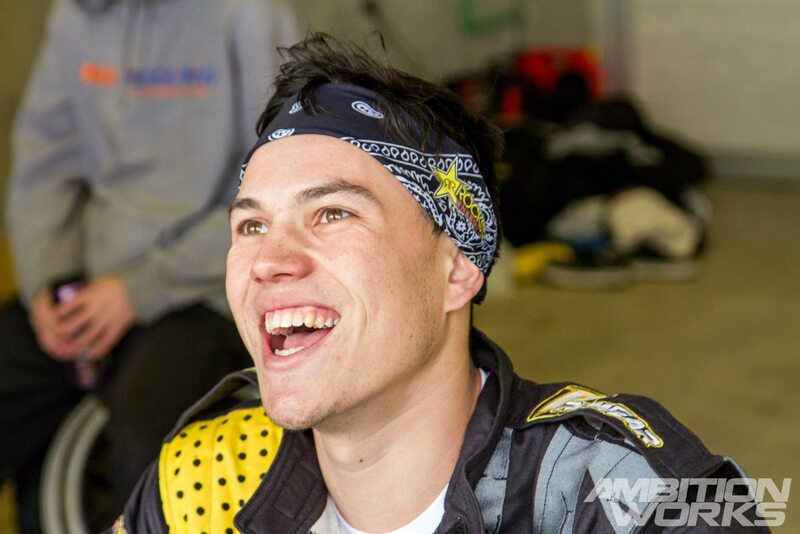 He definitely has the potential to move up to the top drivers with his brother Troy Jenkins next year. 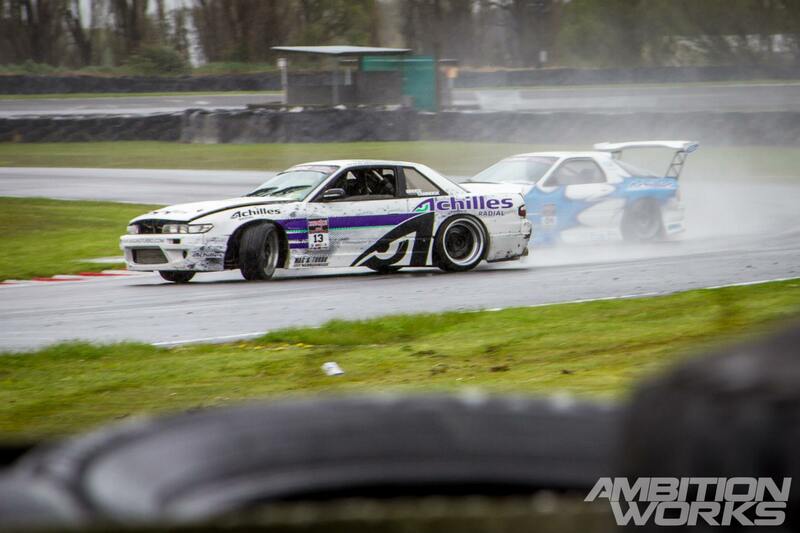 The gravel pit in section two trapped a whole lot of cars on Friday, the rain provided a slippery surface and drivers just seemed to love ‘waiting for a mate’ on track. 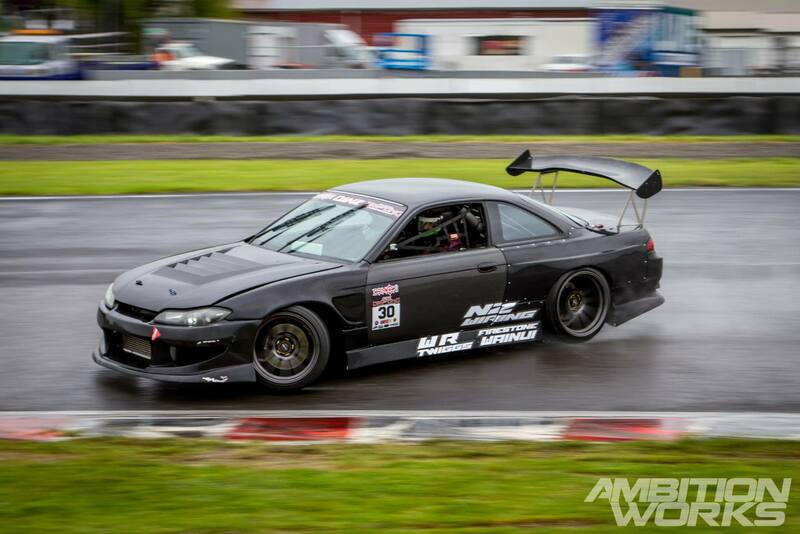 Shayne Giles’s new livery for his S14.5 looked totally angry in the weekend, all black and menacing with massive lock to get that much desired angle that most of the drivers are looking for. 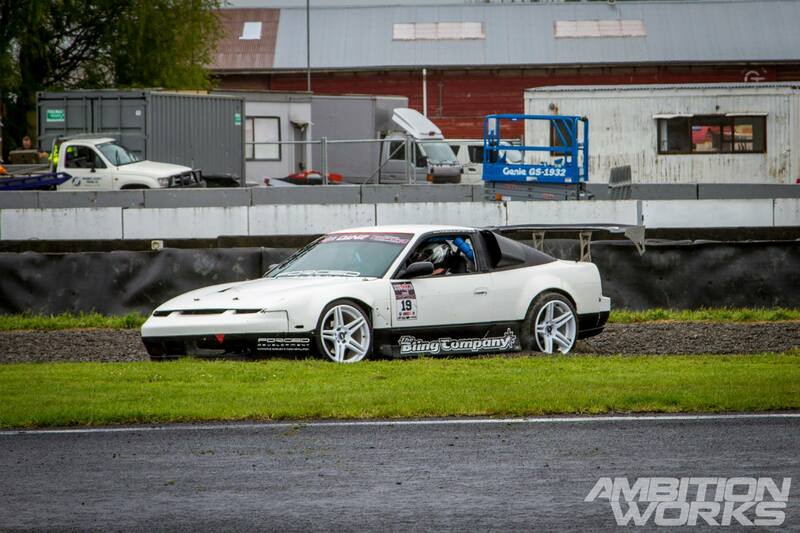 Bruce Tannock left his car’s body scheme pretty much untouched over the off-season, he made the right choice because it already looked amazing. 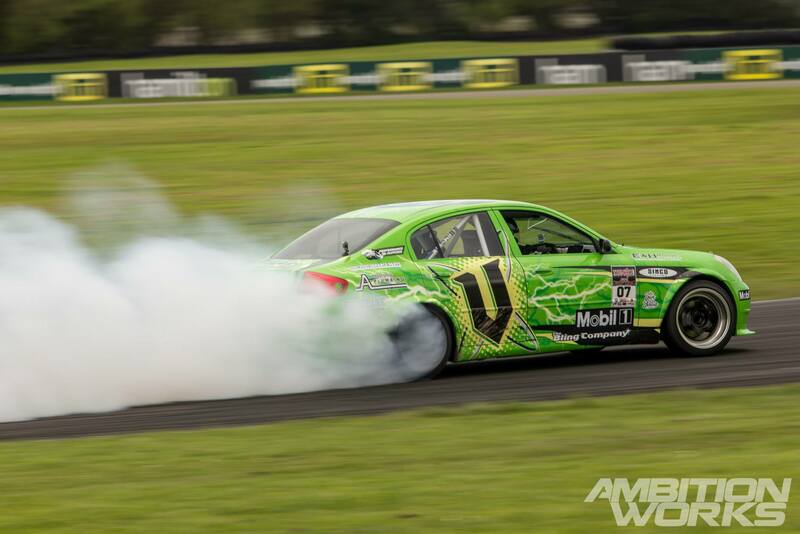 Fanga Dan brought on a new naming right sponsor this season so a new look came with the car, it almost could trick you into thinking you’re watching the V8 supercars in action. 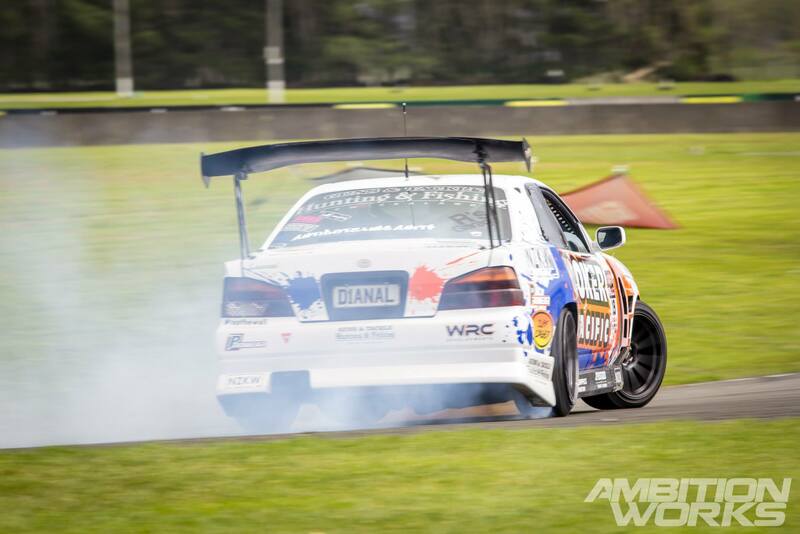 Dirt dropping madness from Gagan Kang, pro-am drivers are really stepping the game up this season. If you didn’t know who was who it would be easy enough to get cars mixed up to which series they belong to. 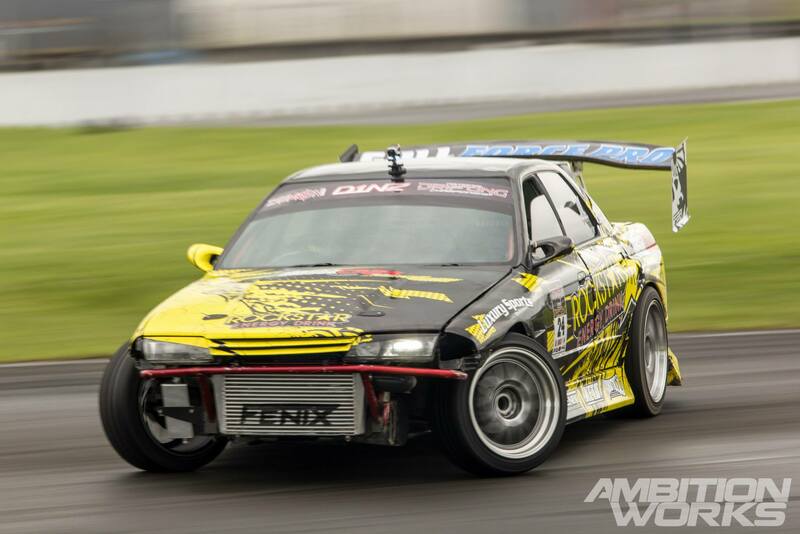 Nico Reid’s new look on the S15 is just mental, it’s as if it’s waiting to pounce on its prey with that aggressive steering angle and those little vampire teeth on the intercooler. With some bad luck and engine problems Nico had to forfeit his battle on saturday pushing him out of a podium position. With the rain still pouring down, cars kept on spinning out, coming off the track, dirt dropping, having a nap in the gravel. It wasn’t a good way to start off the first day of D1NZ this year. 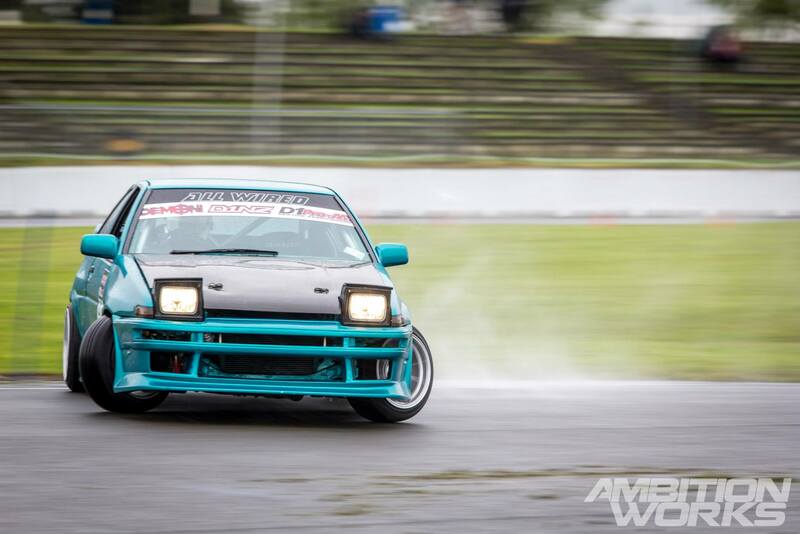 What a little beast Joel Paterson’s little AE86 is, still running a 4AGE turbo engine and with such a light body he can easily keep up with all of the pro-am drivers. 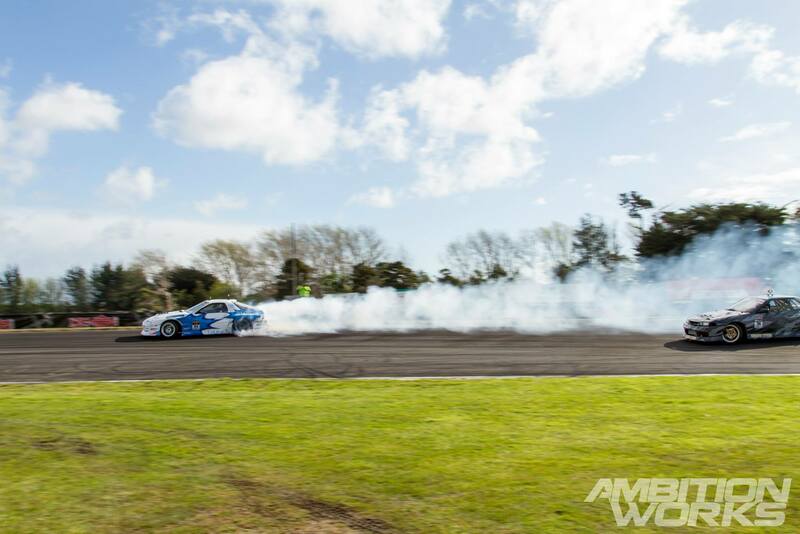 As the weather was starting to get a little bit better in the afternoon some smoke started to emerge from the overly damp tires and race track. 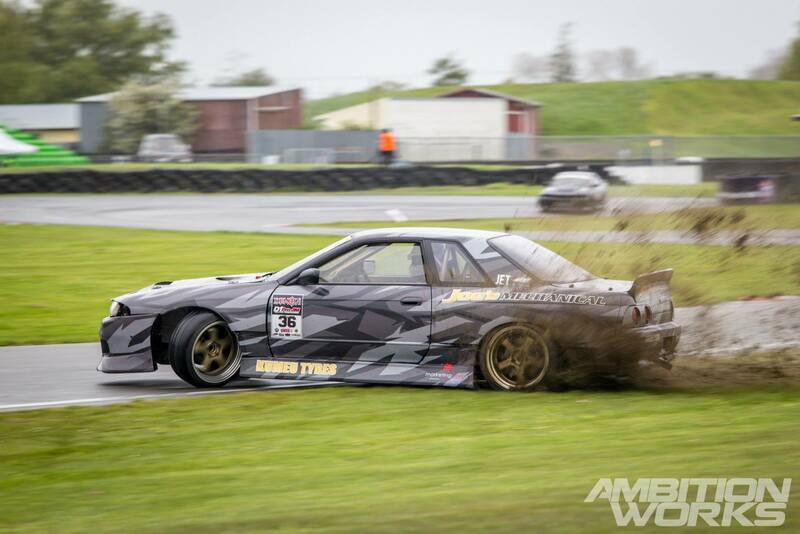 This started to show when Adam Davis left a massive cloud of smoke in his 180SX with a S14A front end swap! 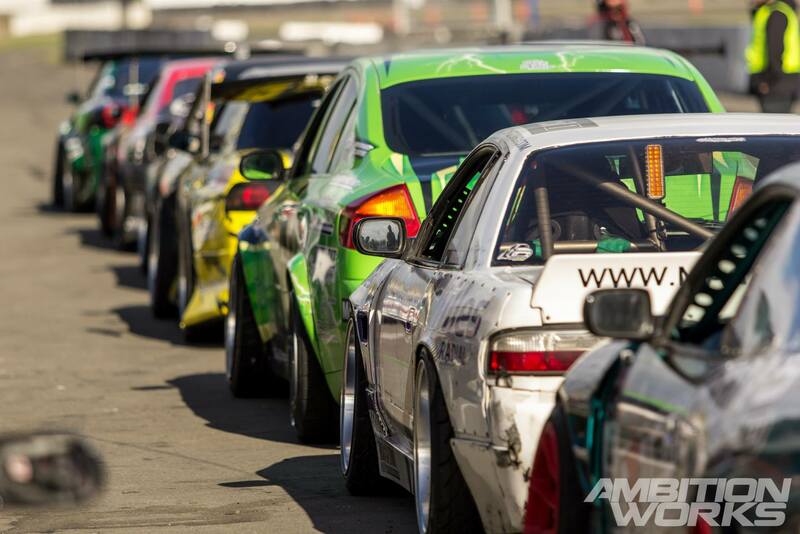 I think one of my favorite parts of any drifting event is watching all of the cars line up in the pits, especially when they are full of colours just like this. What’s this? 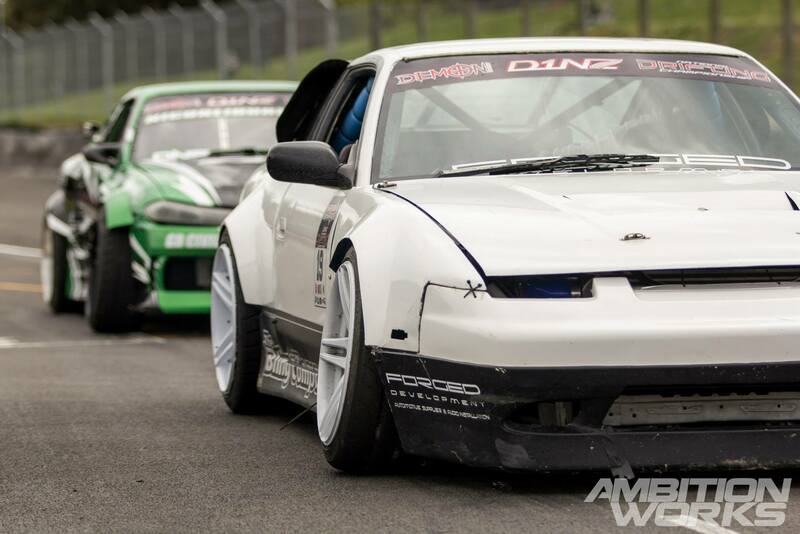 A 180SX with R32 rear end conversion AND front end conversion! 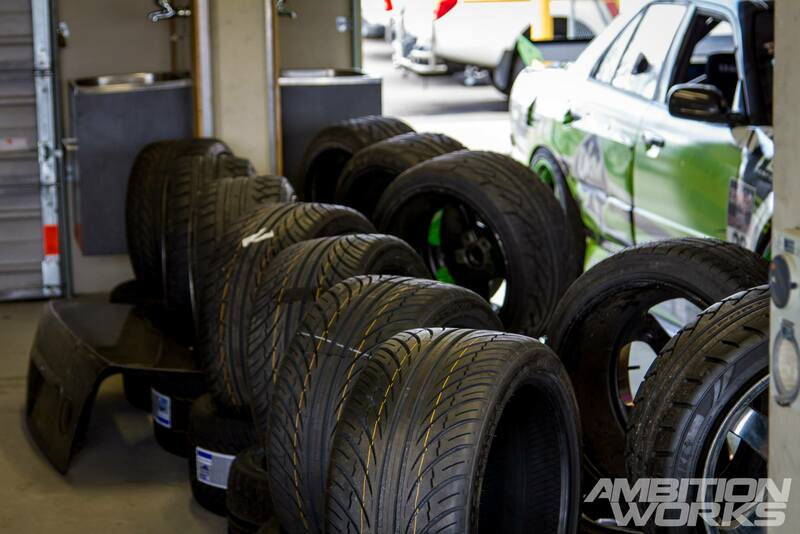 Buying tires is just like getting petrol, it isn’t fun but at least with tyres you don’t have to buy them every week… unless you’re a professional drifter. 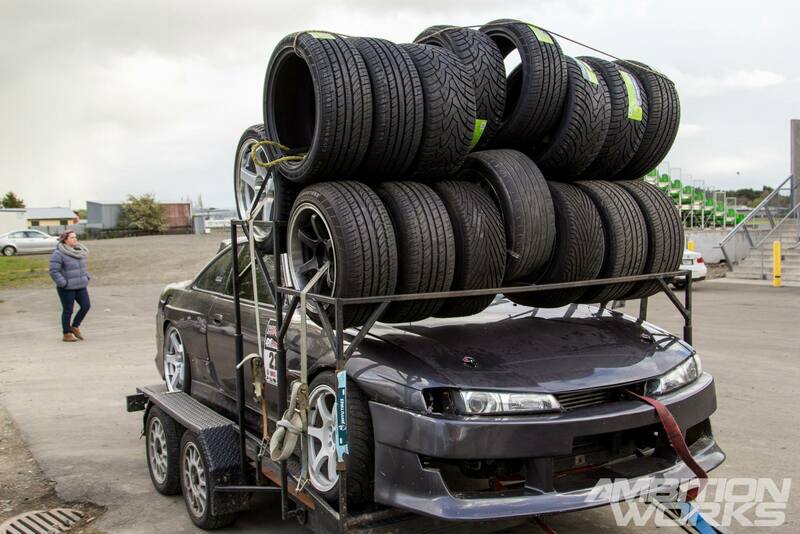 The amount of tyres these drivers go through in two days is just insane, luckily for their wallets Friday was full of rain which saw drivers taking lots of full treaded tyres back home with them. 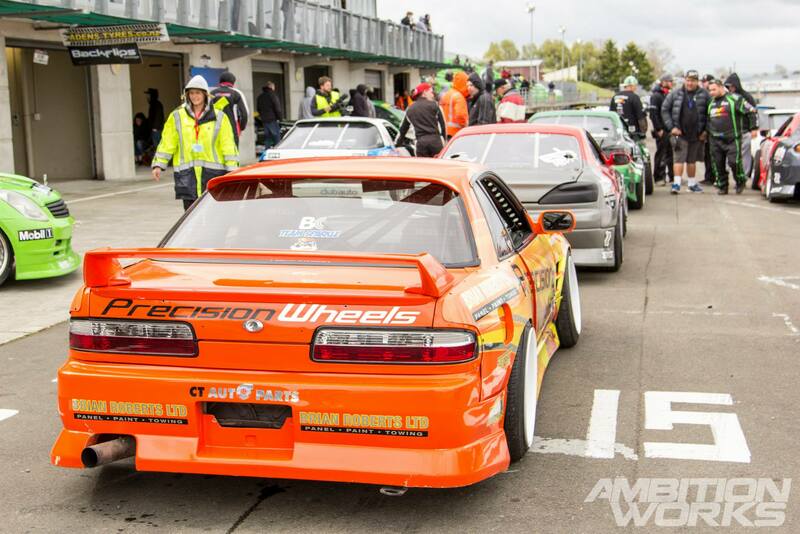 This year we have seen a whole heap of new cars, but also what’s coming out of the woodwork is team cars, there are quite a few team cars this season most of which have one driver in pro-am and one in pro however there are the few that run in the same class. 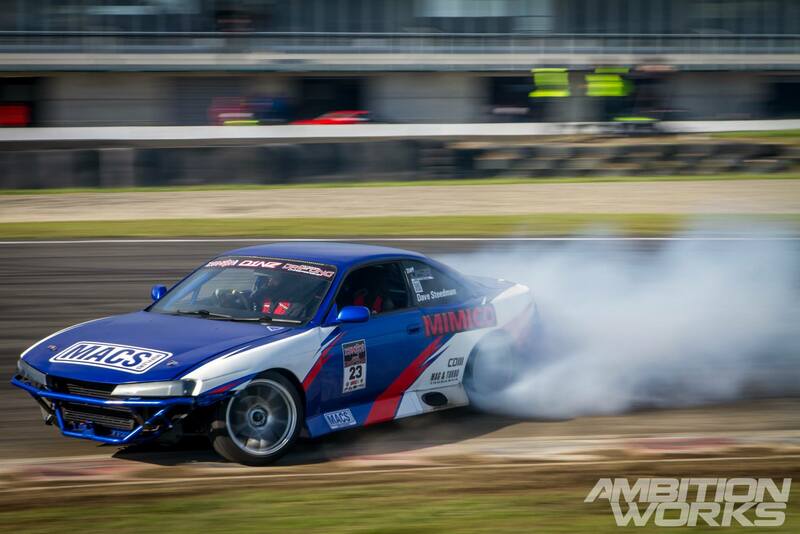 Team DSR’s S14s engine wasn’t playing nice over the weekend but Adam made up for that proving he could take out pro-am this year. 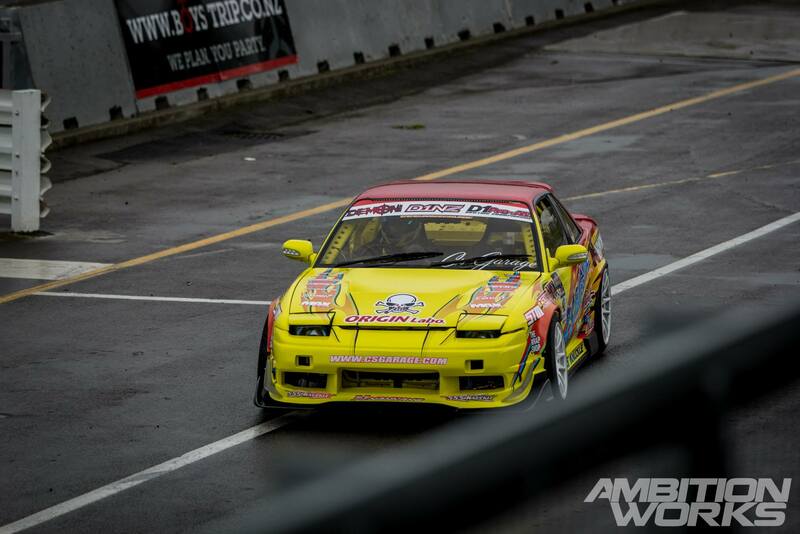 Dave Steedman spent a bit of time in the S14 but had to borrow the pro-am car to battle in the top 32 getting into the top 8 only to get knocked out by Darren Kelly also in a borrowed pro-am class car. Day two at the track on Saturday started to show a good day ahead with no rain for most of the day. 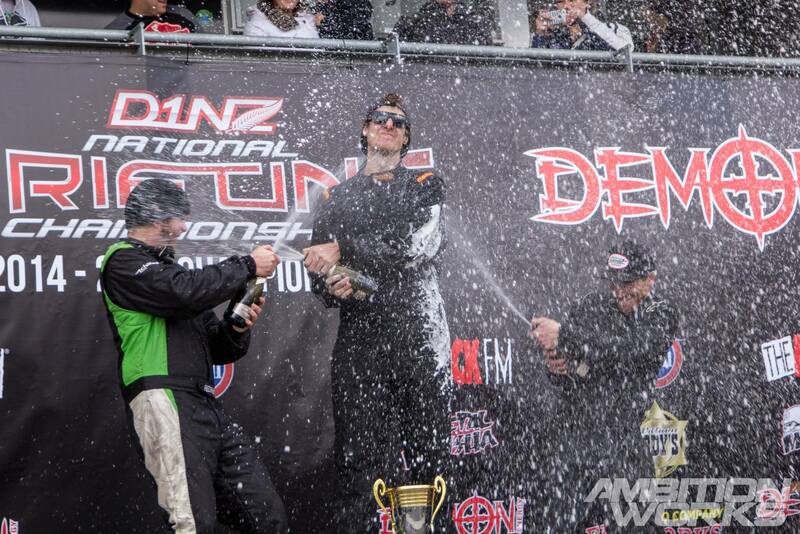 Drew Donovan kept the same look as last year, being consistent the whole day but unfortunately not grabbing a podium position either. 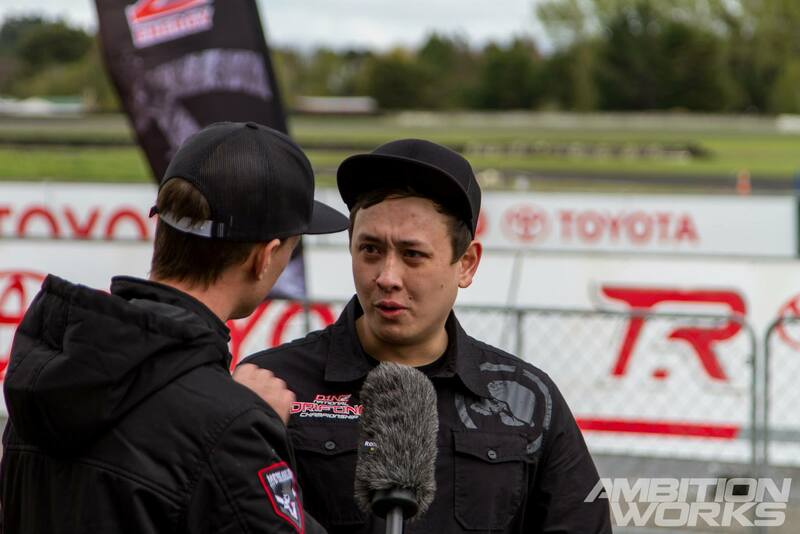 “ZEUS” named by pro driver Joe Kukutai is one driver to watch like a hawk this season, grabbing Rockstar as a naming right this time round Joe won’t be backing down. With his aggressive driving style he gets close and personal during chase runs, round one wasn’t so kind though as his day stopped early being knocked out during the battles. 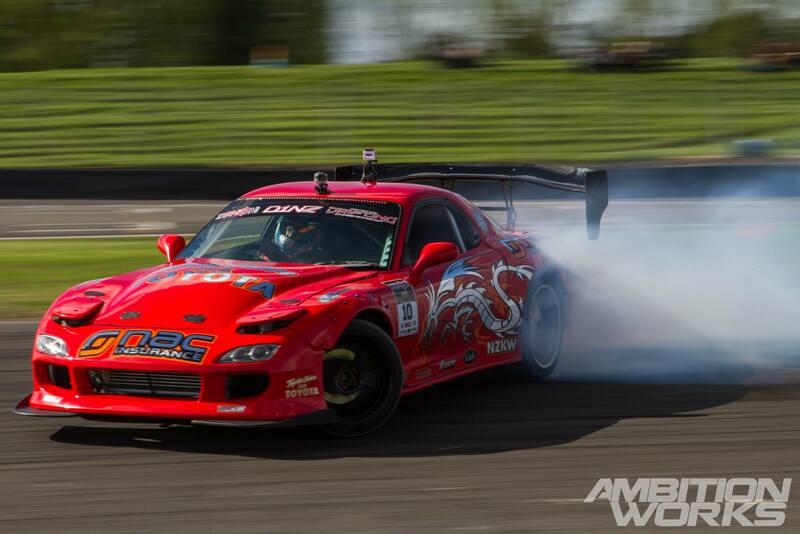 This has got to be my favorite car to photograph this season, Andrew Redward’s RX7. With it’s white body and silver wheels it is a photographers dream to shoot. With a few troubles here and there his team managed to get him back on the track every time to finish Saturday still in his own car and not a borrowed one! 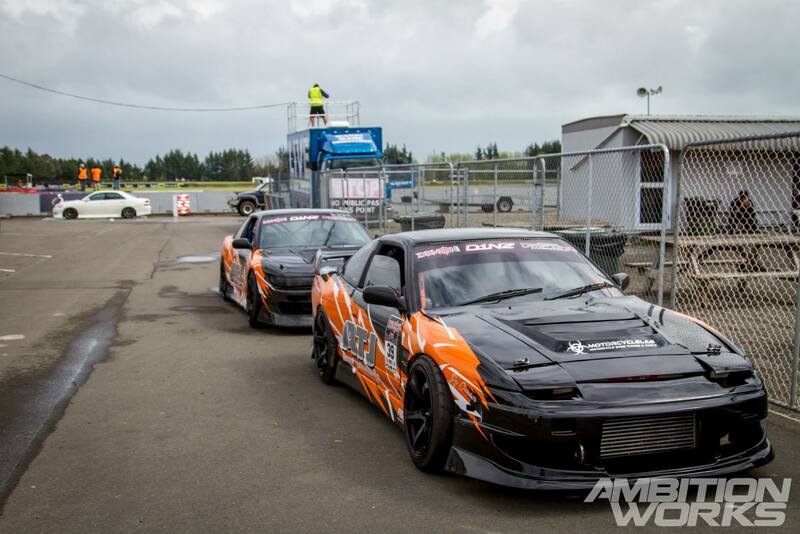 Matt Lauder’s 180SX has a very different look to it than the other Silvias in his field. 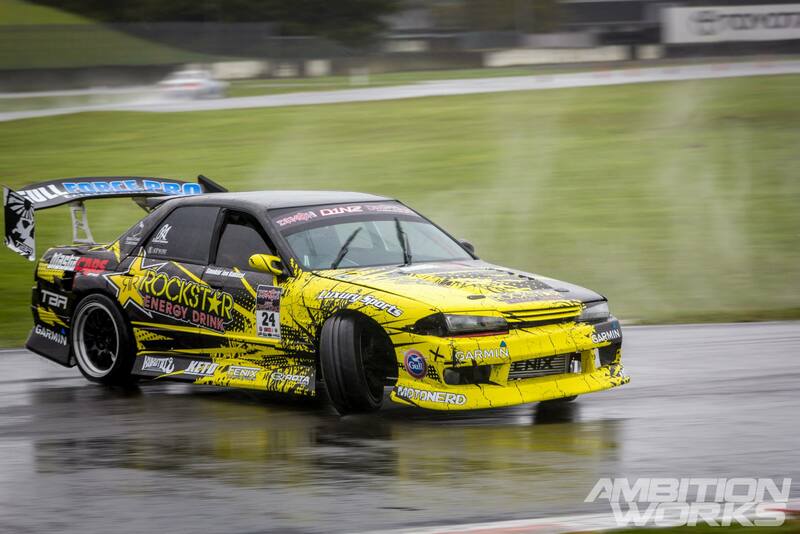 Doing most of the work himself and with hardly any sponsors looking at his very naked car he still runs in the pro division. By afternoon the sun was shining through the clouds and some impressive practice battles started to play out. Here we can see Daynom Templeman sitting right on Bruce Tannok’s door. 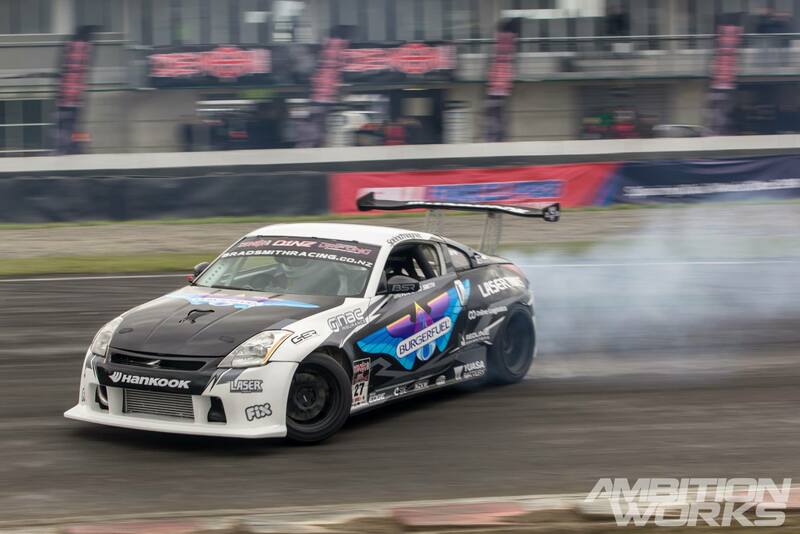 Brad Smith gave the 350Z a little bit of white this time round which really made it pop out. Only two 350Zs are running this year, Brads and Sky Zhaos. 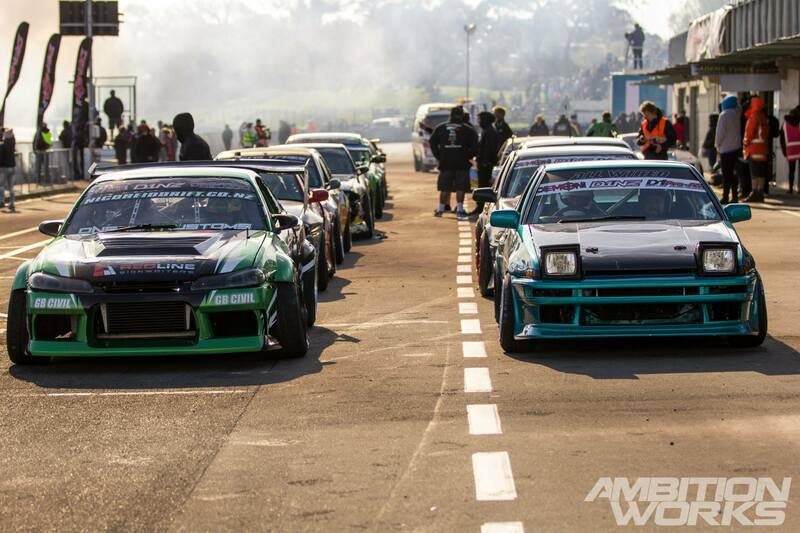 Who doesn’t like a drift train? 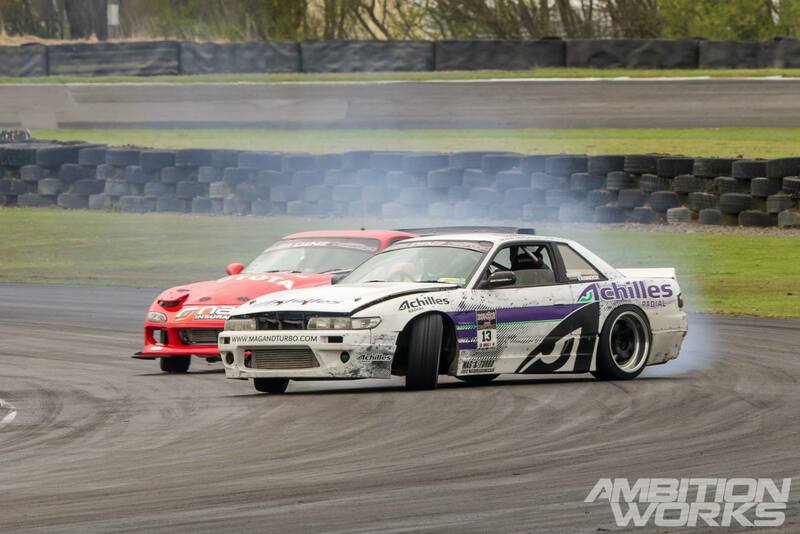 Joel Paterson wasn’t pulling back all weekend, knocking on Olivacrona’s S14s door. 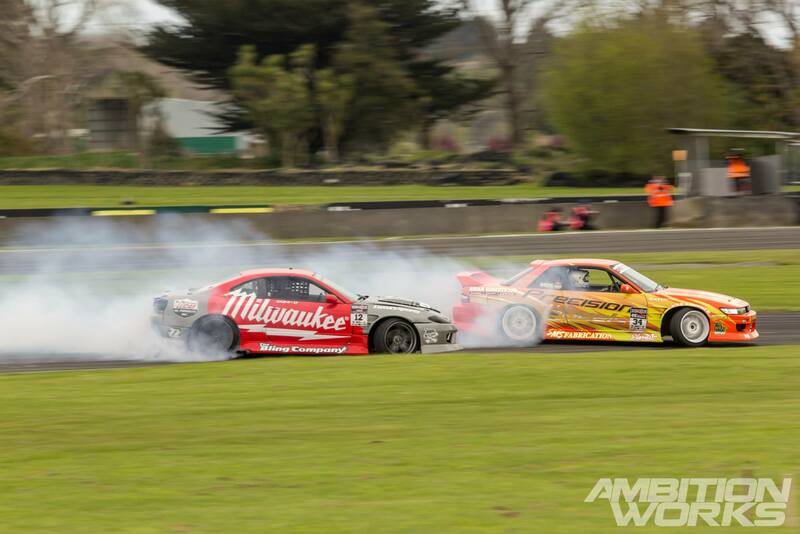 Close battles between Joel and Adam lead to a couple of OMTs but we weren’t complaining because every battle they had was good enough to be in the pro class. 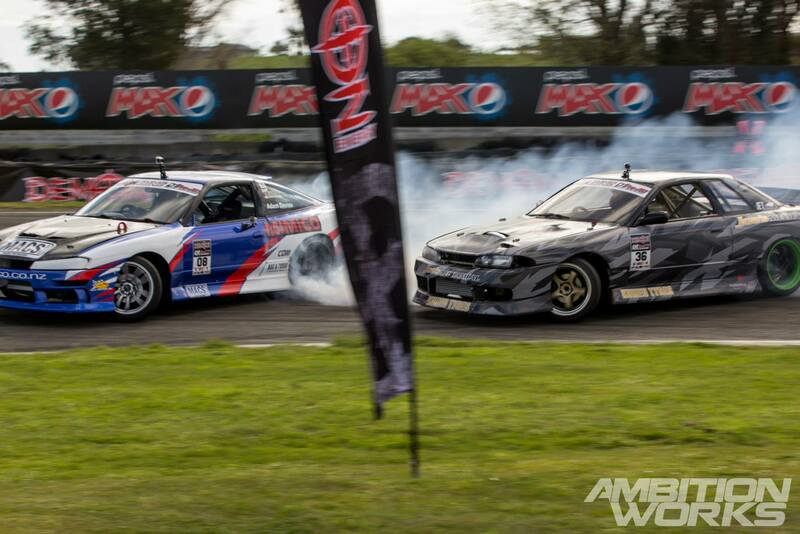 Chad McKenzie in his Skyline trying to pull away from Joel in another close battle. As the day went on the battles started to get better and better, with the cars gradually inching closer to the door of the driver in front. The C’s Garage cars stand out so much, it’s all about the little details. 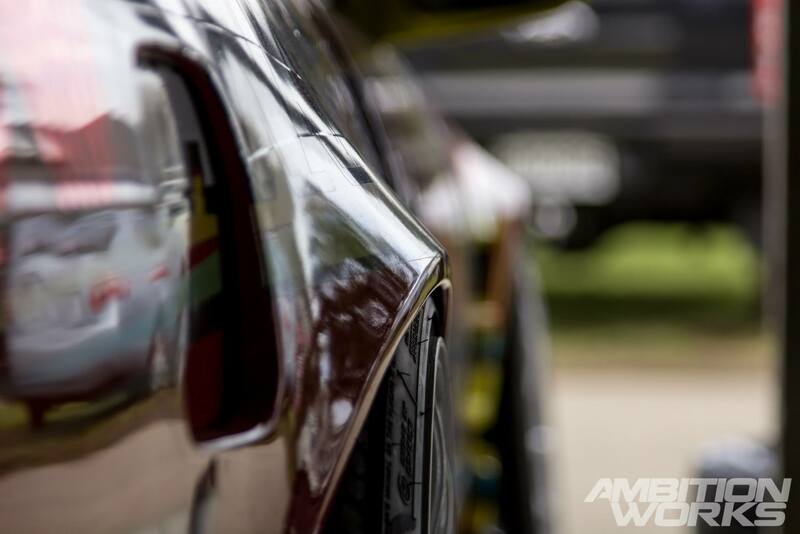 All of those little details are about to be dragged along the ground soon when that bumper rips off! Lunch time at D1NZ means the pit walk, this is when the drivers can show off their cars, take photos with fans, support their sponsors, sell signed posters and merchandise. 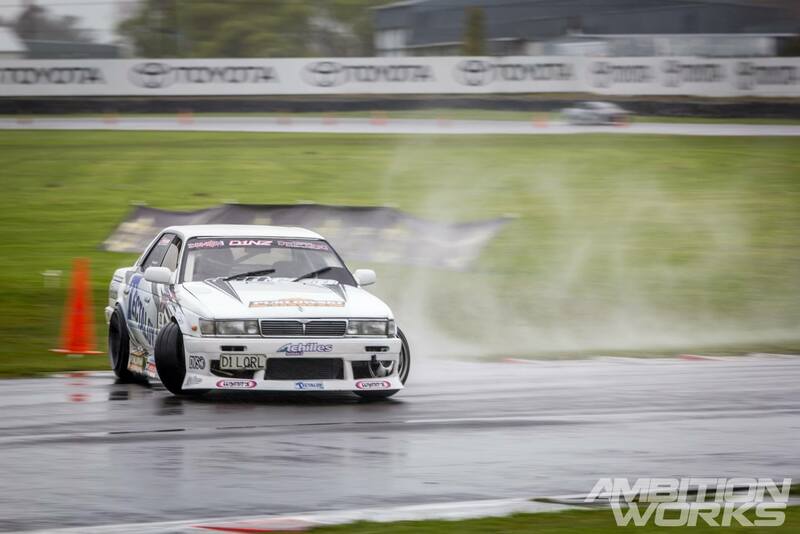 The STM 86 had to come up to try and fix the C’s Garage S14 due to engine problems. What a nice little 86 it was too. Wide body’s are becoming pretty standard these days, the curves they give cars put a whole new spin on the overall look. 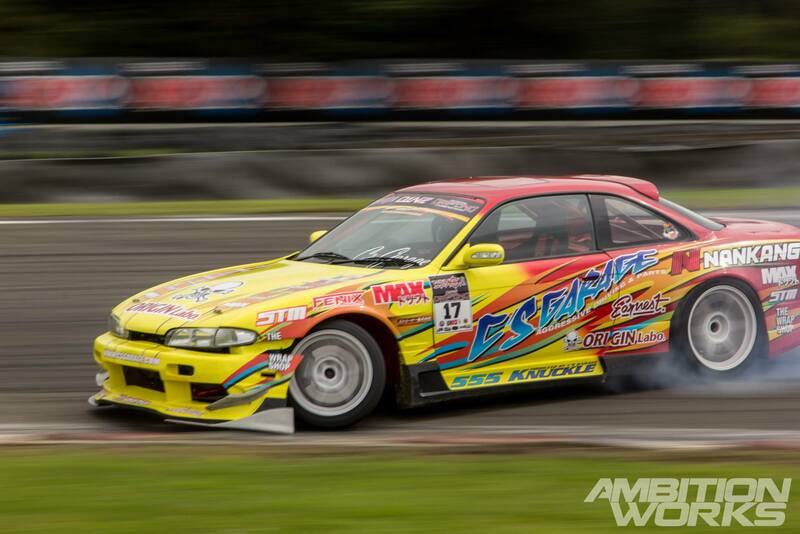 That and the massively wide wheels that can be run. Lunchtime entertainment included a few motorbike jumps, but as the wind picked up it seemed a little bit too dangerous to be jumping off massive ramps only to fall off from the heavy wind that stayed around all weekend. 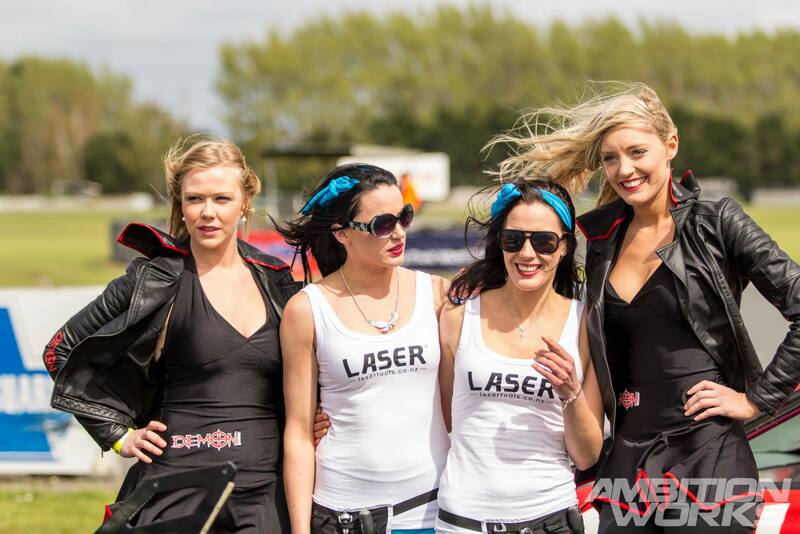 Promo girls started to appear for the pit walk as well, always ready for a picture and a laugh. Here we can see two very cold promo girls, in between warmer promo girls. This series D1NZ partnered up with Maori Made Productions to bring live streaming to people that couldn’t make it to the event. This included live interviews with some of the drivers. 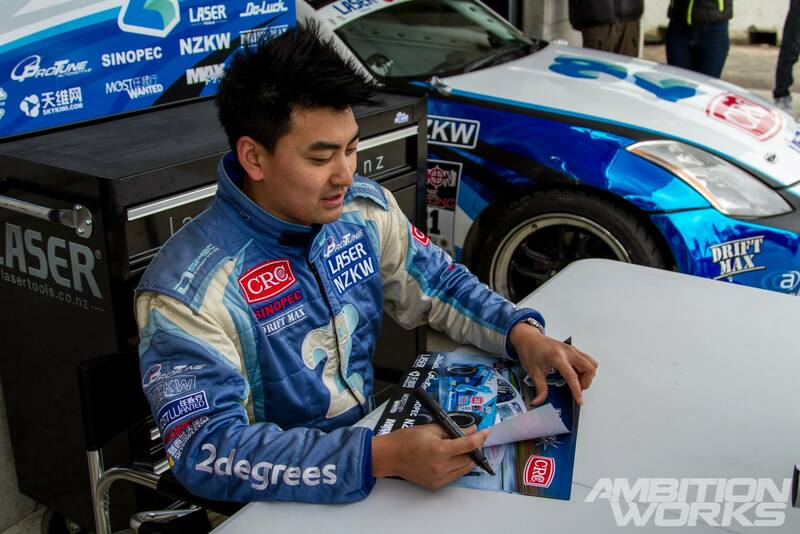 Mr. Sky Zhao had a bit of bad luck during practice and had to replace the clutch, it’s no reason to be sad though, as he still was able to give out signed posters to his fans! Not even 21 yet Joe has captured quite a large following with one of the biggest lines at the pits, he certainly has a bright future ahead. 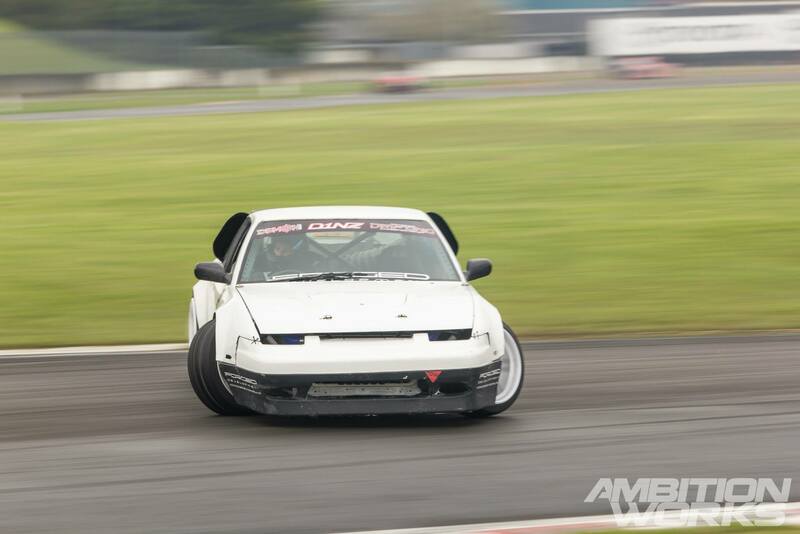 Is it just me or does the crazy amount of negative camber on the front wheels give the back wheels the illusion that they have positive camber? Anyone that braved the weather on Saturday got the chance to check out their favorite drivers and their new cars, this pit was filled up with Silvias galore. 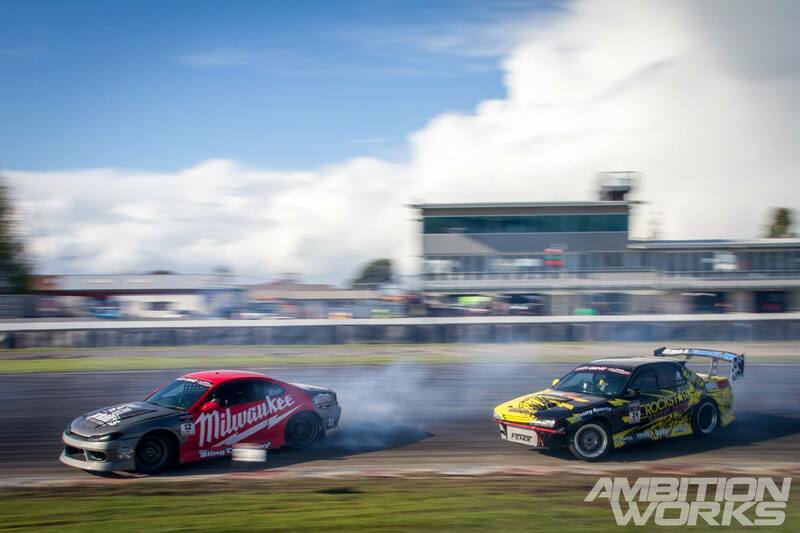 After lunch qualifying got underway with the top 32 battles, with the sun shining and the track dry, it was time for some door to door action between the top drivers in New Zealand! 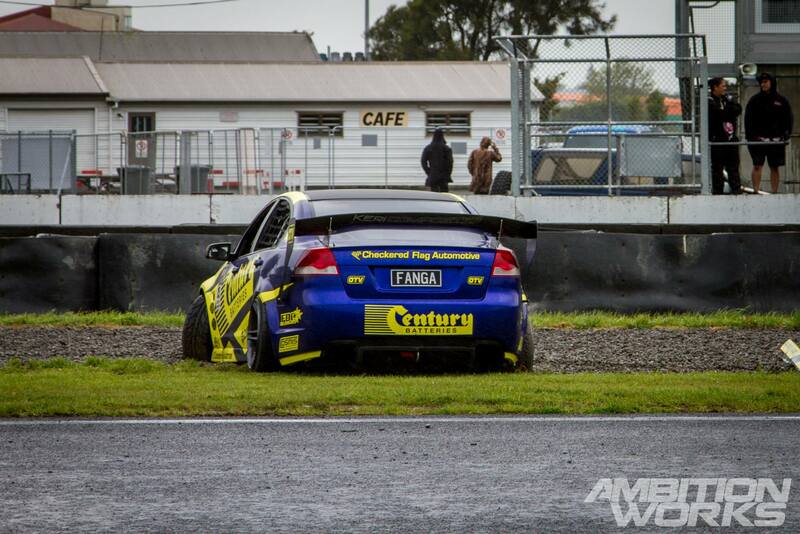 Fanga Dan’s Holden had mechanical issues so he borrowed pro-am drivers car Ben Jenkins. Although it laked a little bit of power, it was still very light and he managed to keep up with the pro cars before being knocked out. The battles kept rolling out throughout the late afternoon, spirits were high and the good weather kept shining over Manfeild for us, right up until after prize giving. 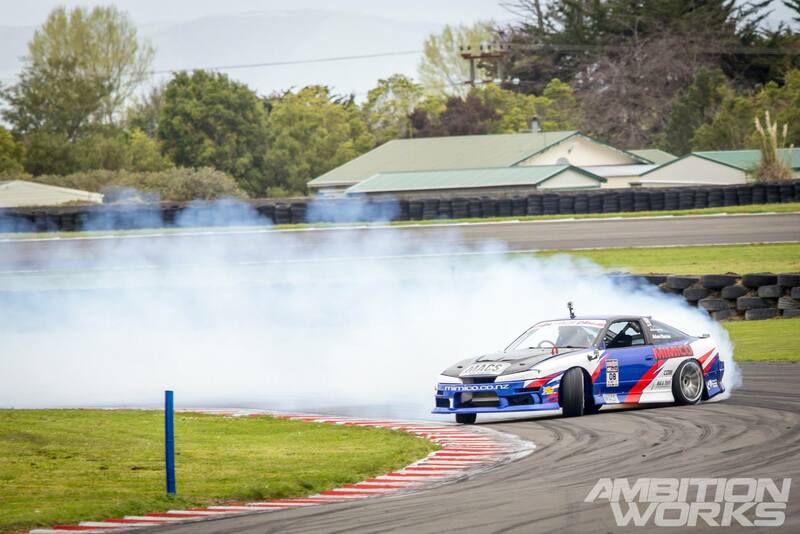 Cole Armstrong laid down a cloud of smoke in his Skyline. 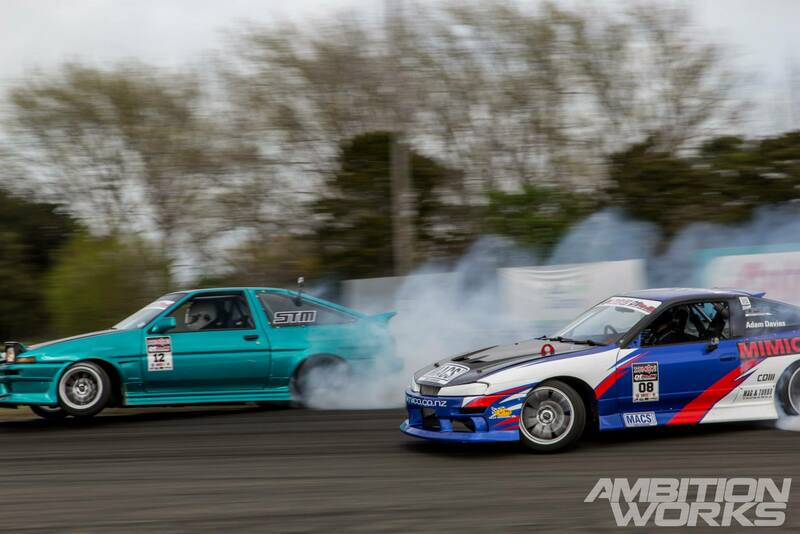 I’m not sure how chasers are suppose to drive, let alone drift when they are covered in smoke. 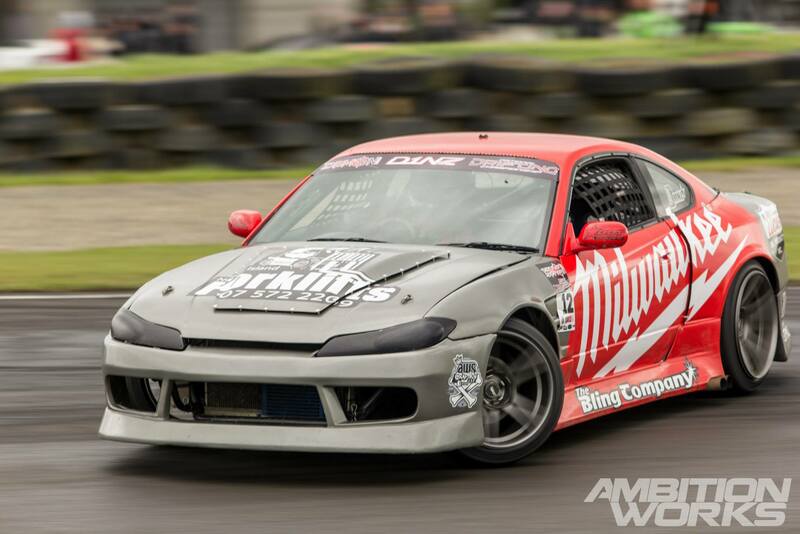 Troy Jenkins was right up close to Joe Marshall in his 180SX, as you can see here on Troy’s S15, as the track became dryer and dryer drivers starting taking off their big monstrous wings. 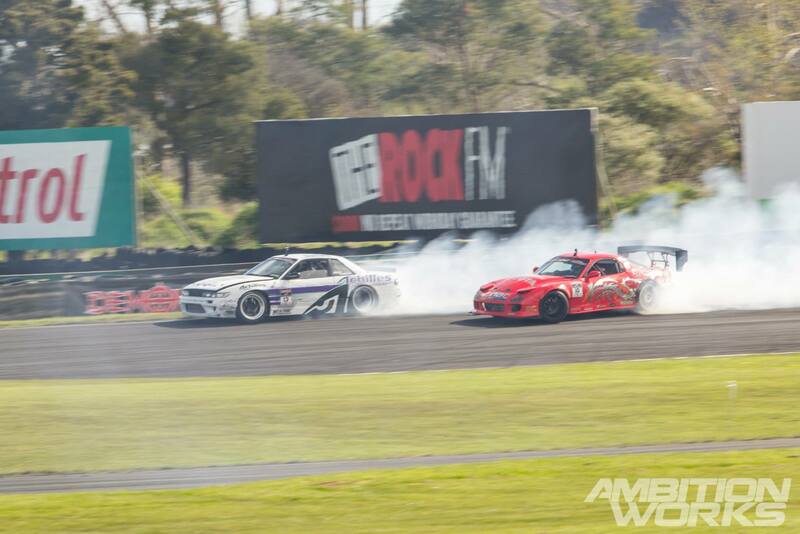 The sun started to hit hard by this time, the silver dragon on the side of Daynom’s RX7 gave the car a unique look different to most of the cars this series. 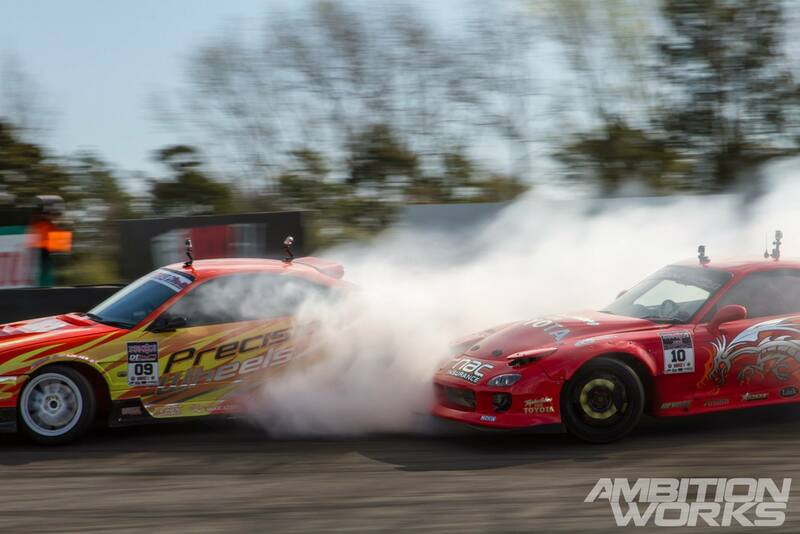 Two borrowed pro-am cars fighting for a spot on the podium. 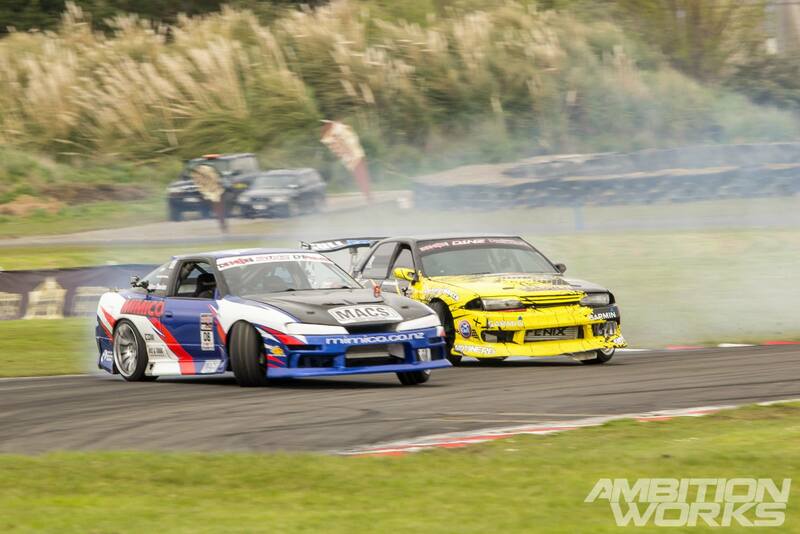 Darren Kelly in Gagan Kang’s Skyline and Dave Steedman borrowing team mate Adam Davis’ 180SX. 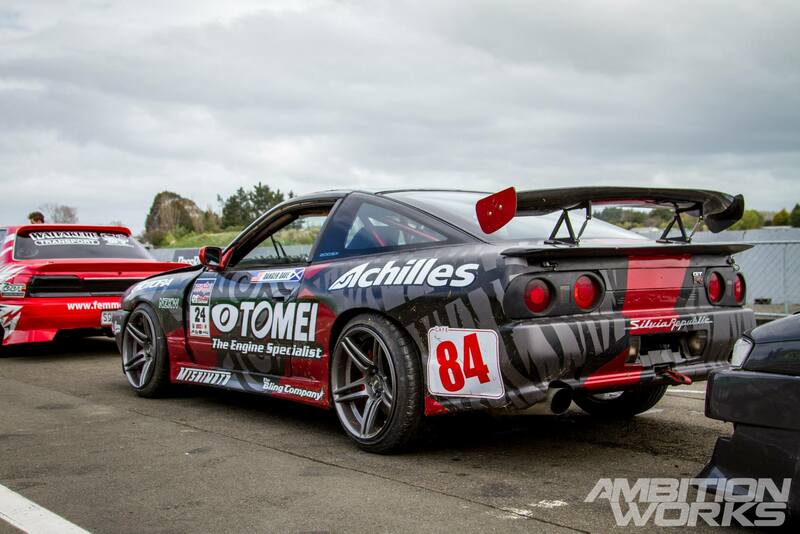 Daynom’s new look on the RX7 sure looks like something straight out of the motherland that is Japan. 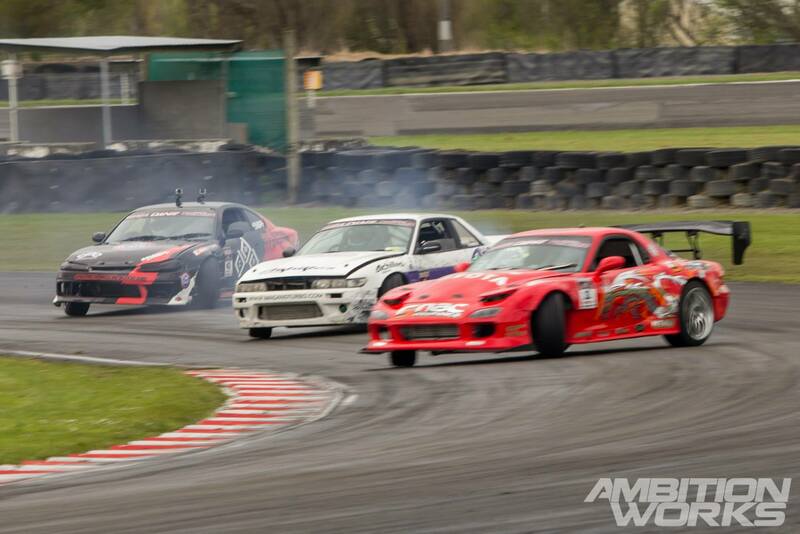 The battle for top four was very intense, with a couple of OMTs because the battles were just that close! 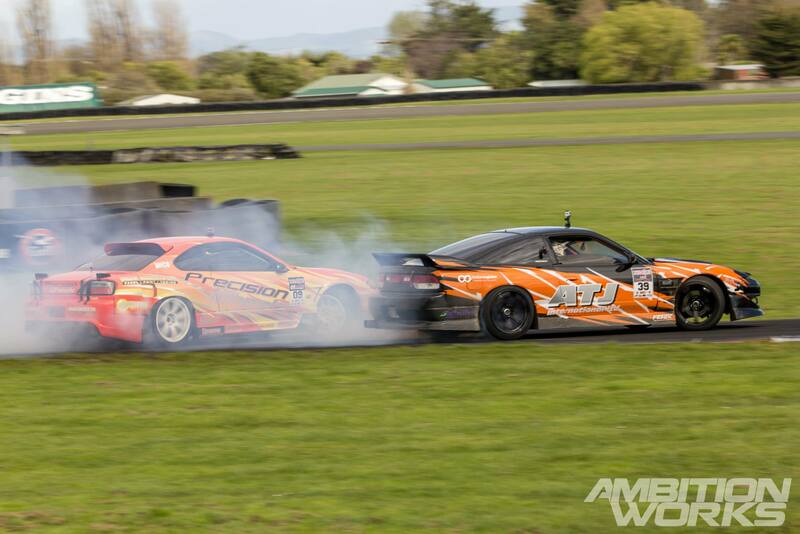 Here we can see Andrew on the brakes stopping himself from hitting C’s Garage driver Adam Hedges borrowing Troy Jenkins S15. 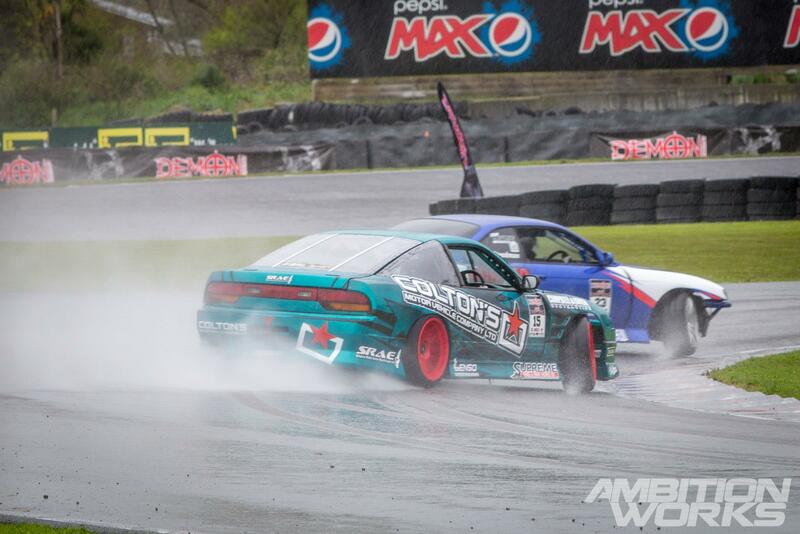 Another close battle for third and fourth position between Adam and Daynom, with Daynom sitting inches away from the Precision Wheels S15. 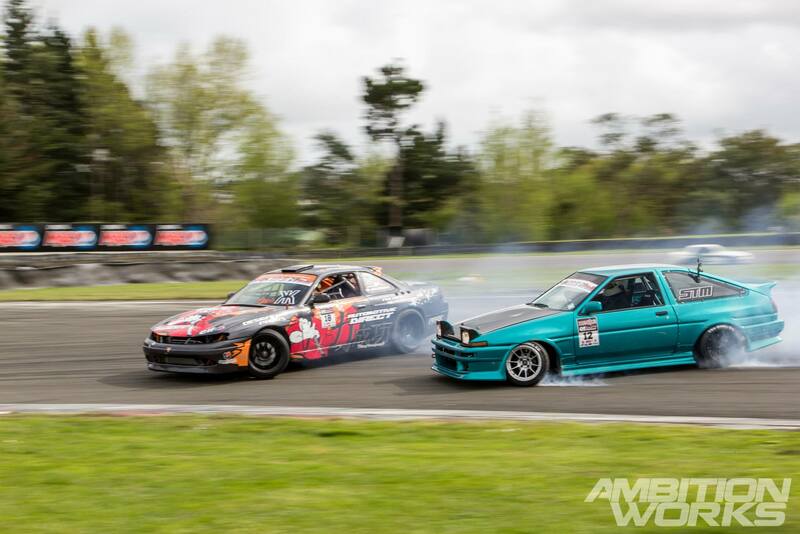 This battle between Darren Kelly and Andrew Redward saw a big gap on Andrews lead run, but Darren took the win in the borrowed pro-am Skyline. 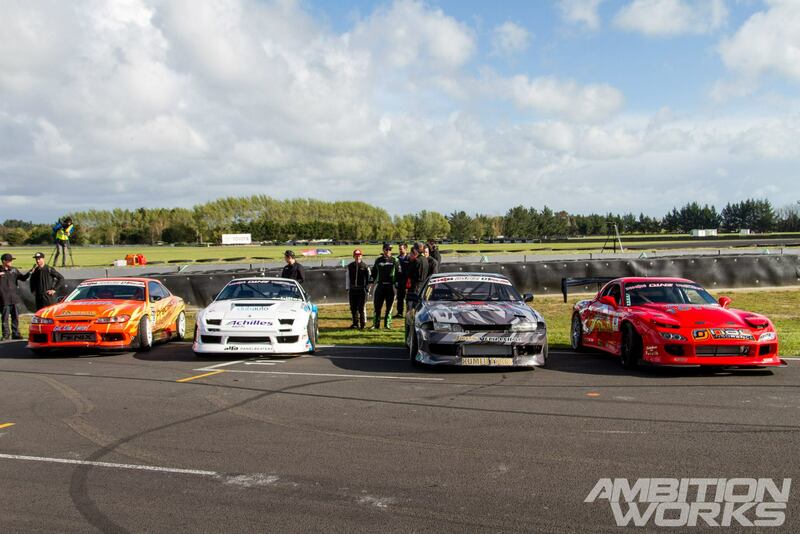 Waiting for the announcement of the top four drivers from the first round of the Demon Energy D1NZ series, this line up includes, Andrew Redward, Daynom Templeman, Adam Hedges, and Darren Kelly. 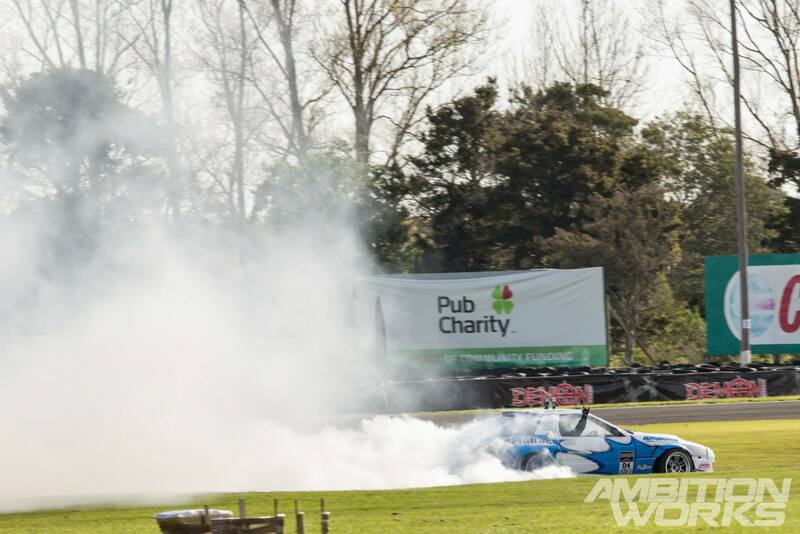 Since half of the cars in the top four were borrowed, only Andrew went out for victory burnouts, leaving a long white cloud of smoke behind him! 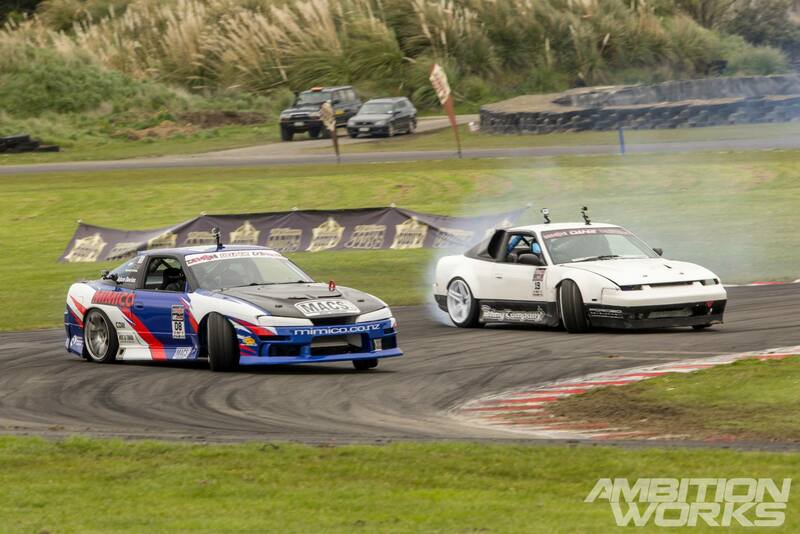 With the pro-am battles and pro battles finished for the day it was time for a couple rounds of expression sessions. 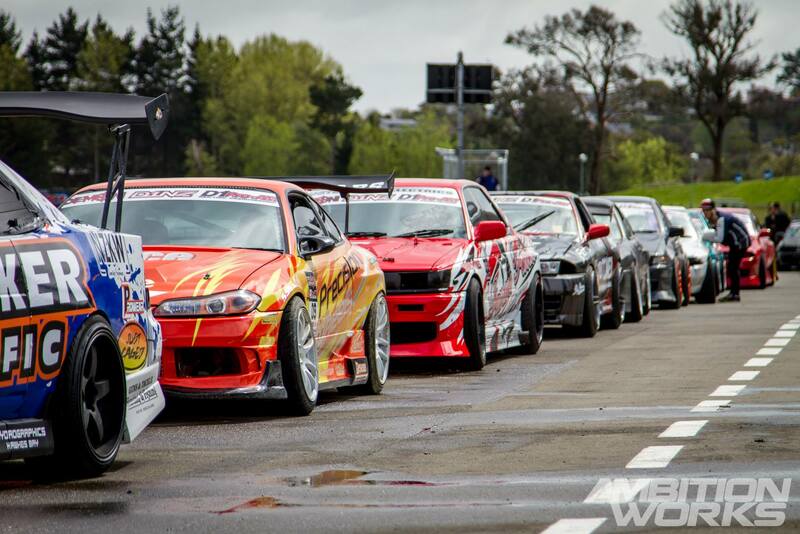 This gives time for the drivers to burn the last of their rubber and give people a few laps around the track. It’s like a singing show, after the pressure is off and they get one more song, they do better than they had ever done before. It’s obvious that pressure plays a tremendous part when determining who will come out on top! 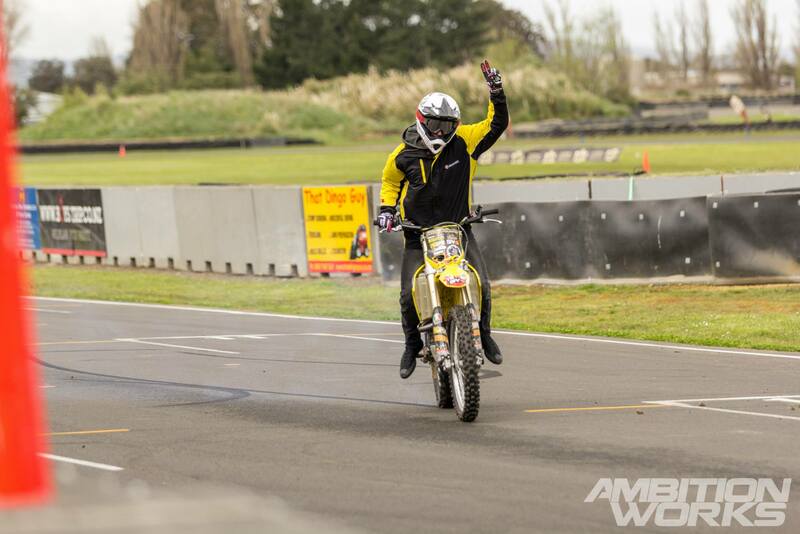 For the pro-am series round one, Troy Jenkins grabbed first position with second position going to Adam Davis. 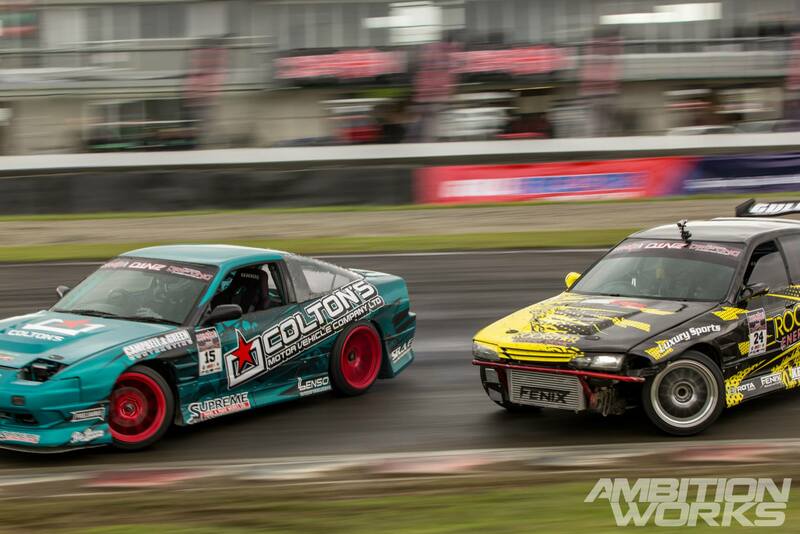 Sneaking up close behind these two taking out third position was Joel Paterson. 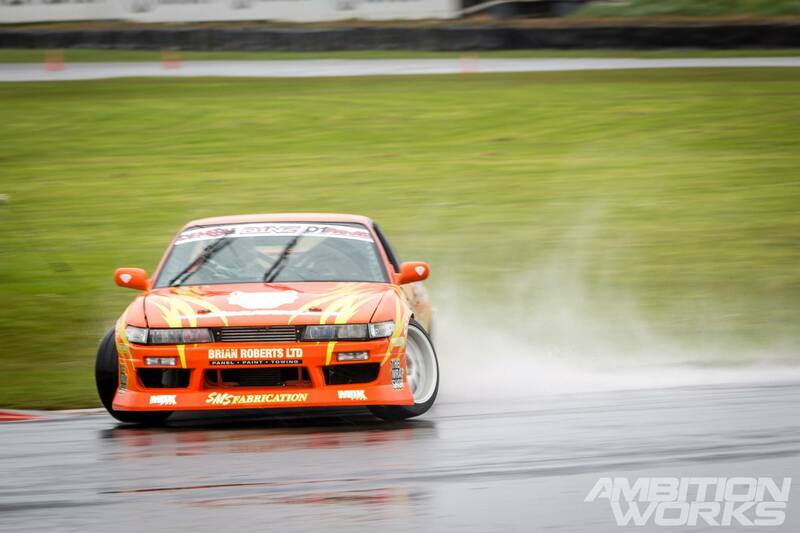 Congratulations to these pro-am drivers, they were on form all day and deserved the wins they achieved! 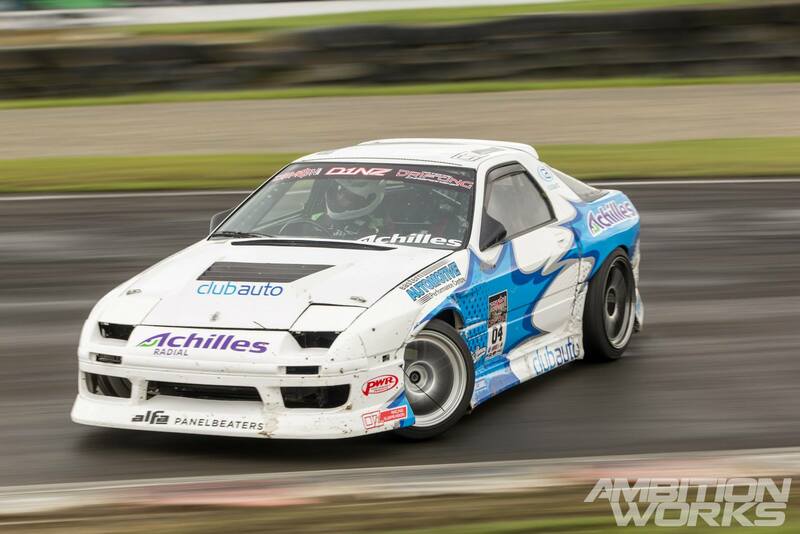 First place for the pro series went to Darren Kelly in a borrowed Skyline, second place went to Andrew Redward in his RX7 and third place was won by Adam Hedges also in a borrowed car. 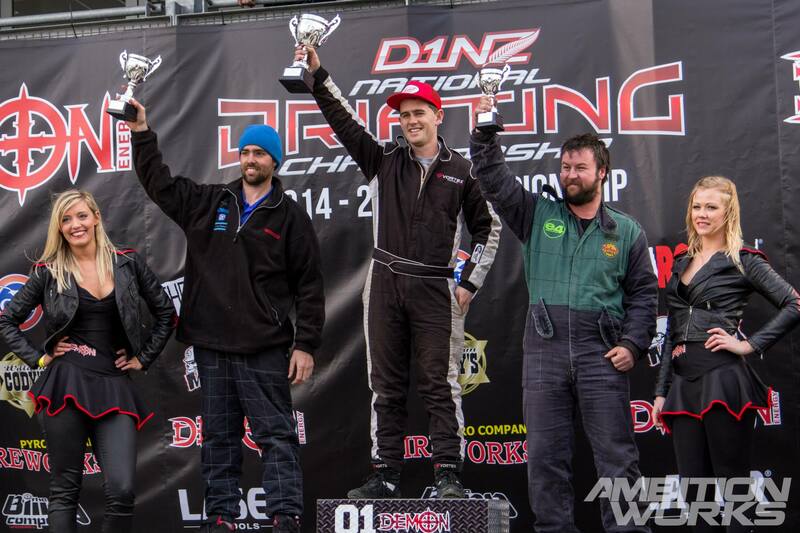 Again congratulations to another three winners, it’s not easy to come out on top of a D1NZ round with the amount of effort that goes in. By this time the rain started to hit, everyone got away lucky on Saturday with good weather for most of the day. Now off to the after party! 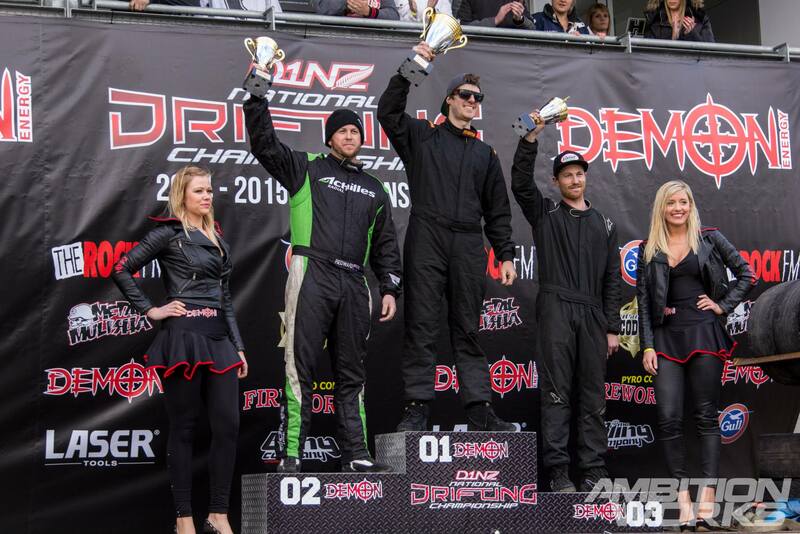 The next round of D1NZ will be held at Mt Smart stadium on the 7th and 8th of November, visit the D1NZ facebook page to purchase tickets. 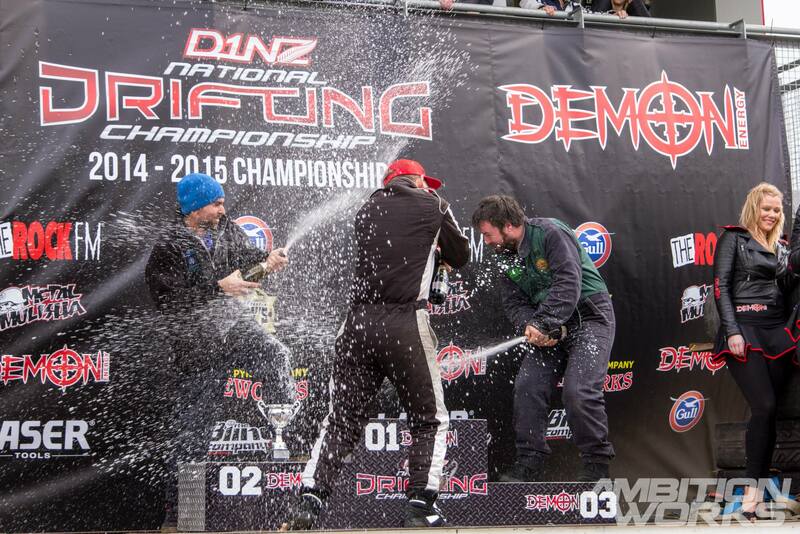 View more pictures from Round 1 of D1NZ on our facebook page.